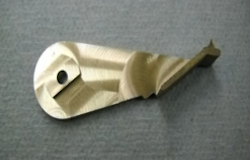 We are a highly experienced team with a wide range of machining services including Water Jet Cutting, CNC Machining, and Prototype Development. The ability to complete each job on schedule with high quality, precision, and consistency sets us above the competition. We combine the knowledge gained from machining hundreds of thousands of parts, apply cutting edge technology, and return the product you need. Get us on your team today, give us a call at 1-800-833-7101 to make our experience work for you. 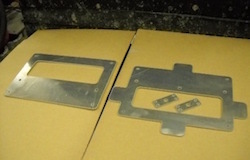 We began Water Jet Cutting in 1989 and since that time have cut hundreds of thousands of parts. What sets us apart from other shops is that we are a full service machine shop offering Water Jet Cutting, rather than being a cutting service only. We are fully equipped to build special holding fixtures for odd shaped parts you may have cast, extruded, forged, or molded. We want to work for you. 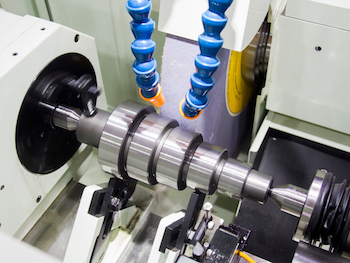 We welcome both small quantity CNC jobs as well as large volume turnkey projects. 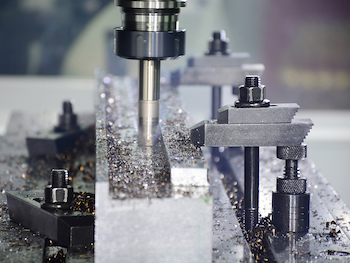 If you have a need for precision machining then you should be talking to us. 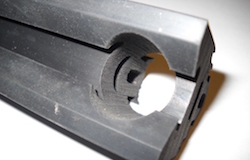 Let us save you time and money by designing and building the holding fixtures needed for machining your castings, extrusions, forgings, or molded parts. When you come to Fargo Machine you can be confident that you will get exactly what you’re looking for without the need for constant supervision and hand holding. If you have a great idea for an invention but don’t know where to start, or if you’ve already begun developing your product but need help taking your business to the next level, come talk to us. We have years of experience developing inventions into retail-ready products. We have in-house capabilities to build molds, create tooling or fixtures, and mill or cut precise parts in addition to the significant resources that we have developed outside of machining to help you take your product into full scale manufacturing in the United States. 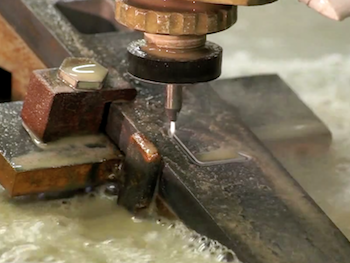 In 1989 we added Water Jet Cutting to the range of services offered at Fargo Machine. Since that time we have used our abrasive water jets to cut hundreds of thousands of different parts. 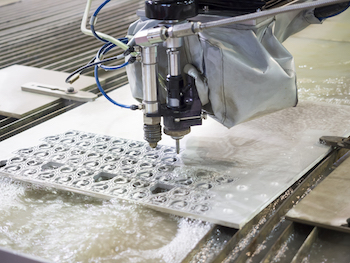 Water Jet Cutting is a unique method of using a very high pressure water stream, up to 60,000 psi, to make precise cuts in nearly any material. 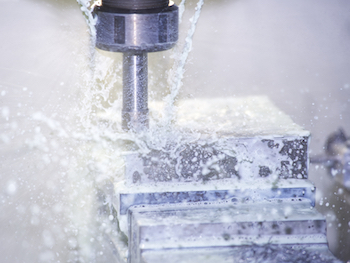 One of the major advantages of water jetting is the ability to cut nearly any material, including aluminum, brass, carbon fiber, glass, Inconel, rubber, steel, stone, and titanium without the risk of a heat affected zone (HAZ) or distortion. 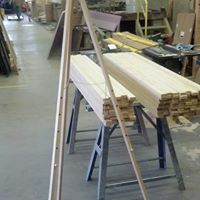 We currently have two different cutting tables, one that is 4 ft by 8 ft and another that is 6 ft by 12 ft. 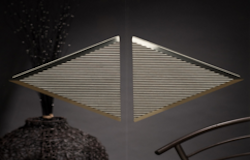 Both tables are able to cut up to 3 inch thick material. If you have the need for clean, no distortion cuts in even the toughest materials give us a call today at 1-800-833-7101 or fill out our contact form at the bottom of the page. We Invite You To Join Our Family Of Satisfied Customers. As the first CNC Milling shop in our area, we have been setting the standard for quality CNC Machining since 1978. With over 40 years of both machining and CNC experience we have the knowledge to accomplish even the most challenging and unique projects. We welcome both small jobs and large turnkey projects. Our shop uses Fadal 4020 CNC Vertical Machining Centers, ensuring quality in every part. With the diversified range of services offered at Fargo Machine we are amply equipped to handle the entirety of your project, including designing and building the holding fixtures needed for machining your castings, extrusions, forgings, or molded parts. 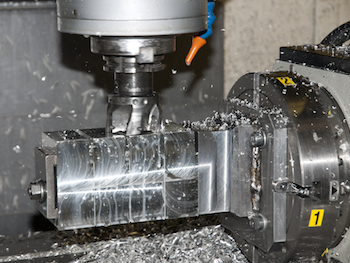 Often companies in the need for machining services do not have the time or personnel to design the tooling required for their parts to be machined. We are a company that can take a few drawings, sample parts, or sketches and run with it, providing you with exactly what you were looking for. 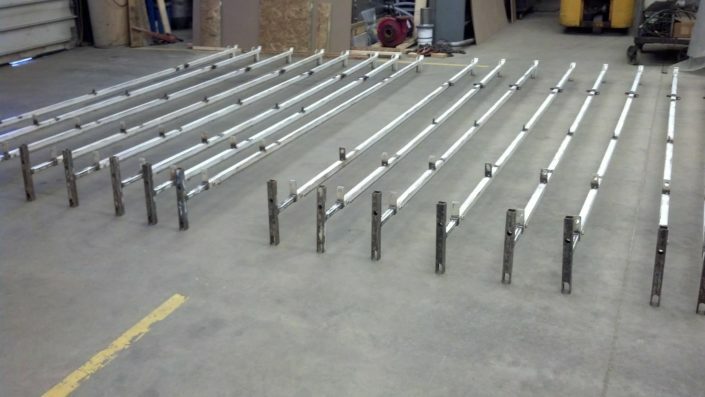 Often we receive limited information from customers, but in a short amount of time we will get the production parts flowing through our CNC machines or the special machines that we’ve constructed. If you have the need for small or large quantity CNC Milling give us a call today at 1-800-833-7101 or fill out our online contact form at the bottom of the page. There is nothing like the satisfaction of invention and creation. Working with inventors to help them transform an idea into a retail ready product is one of our passions. We are able to handle new product development from design to successful marketing and selling of your retail product. Our range of machining experience and manufacturing knowledge give us the skills necessary to elevate your product to production level. We can help with product design, constructing the necessary tooling, molds, and forming fixtures, manufacturing the product, packaging, and finally shipping to the end consumer. Our most recent addition is a 3D printer which now allows us to quickly build a 3D sample of a part or product to be held and touched. We will also be launching a new e-commerce site soon. If you have a great idea for an invention but don’t know where to start, or if you’ve already begun developing your product but need help taking your business to the next level, give us a call at 1-800-833-7101. 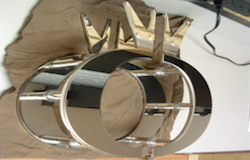 Imagine collecting a royalty for each of your products as we manufacture and ship them! Founded in 1974 by Larry S. Fargo, Fargo Machine Company has grown from humble beginnings in a 24 ft by 24 ft pole barn into its current 12,000 square foot facility at 998 Stevenson Rd. in Ashtabula, Ohio. As business grew the original pole barn was doubled in size but within a few short years, in 1978, a much large 5,000 square foot building was constructed including a 1,200 square foot office to allow operation to be increased further. In 1985 the building was more than double again to a total of 12,000 square feet. 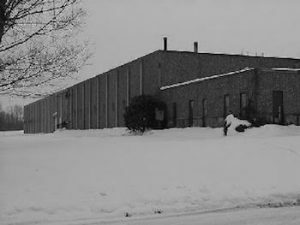 Through the 1985 exapansion most of our customers were located locally in Ashtabula County, including plastic molders, manufacturing, and forging companies. The new larger facility however provided the possibility of expansion and Water Jet Cutting services were added in 1989. 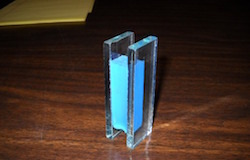 The new Water Jet capabilities significantly increased the customer reach throughout Northeast Ohio and Western Pennsylvania. As reputation for Fargo Machine’s Water Jet services grew so did the customer base, reaching all the way to Connecticut, New Jersey, and upstate New York. Many of our parts are on Norfolk Southern Railroad bridges located all over the United States. Some of our other large projects include making parts and assemblies for energy absorbing barrier gates for lift bridges on both the East and West coasts; the largest being installed on the Woodrow Wilson Bridge leading into Washington D.C.. Other recent jobs include cutting parts for a world renown artist whose art has been sold to Nike, including an installation in Japan. Another product that Fargo Machine manufacturers is also being sold throughout the United Kingdom. From its modest beginnings in a country pole barn to world-class machining with parts and products shipped internationally, Fargo Machine Company is ready and capable of completing your project today! 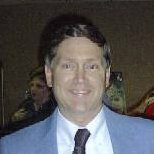 46 years of machining and manufacturing experience working with numerous types of materials, machinery, processes, and methods. Worked with inventors to help them get their idea transformed into a viable, sellable retail type product. 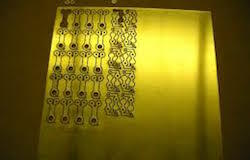 This included designing the product to be easily manufactured in the USA. 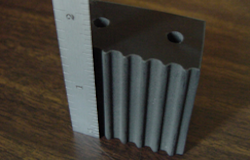 Building molds or tooling required, producing the product, packaging, advertising, and selling the finished goods. At Fargo Machine we believe in the importance of a strong community and the need for mutual support among community members. We take our role in the community seriously and participate in local events often throughout the year. The gallery below highlights some of our recent community projects. We are pleased and honored to have some of our cutting work on display at Ultimate Appearance Hair Salon on Main Avenue. 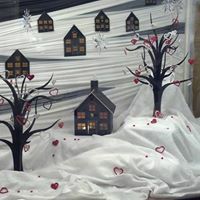 The salon’s windows are always adorned with scenery and decorations that coordinate with the season or holiday being celebrated. 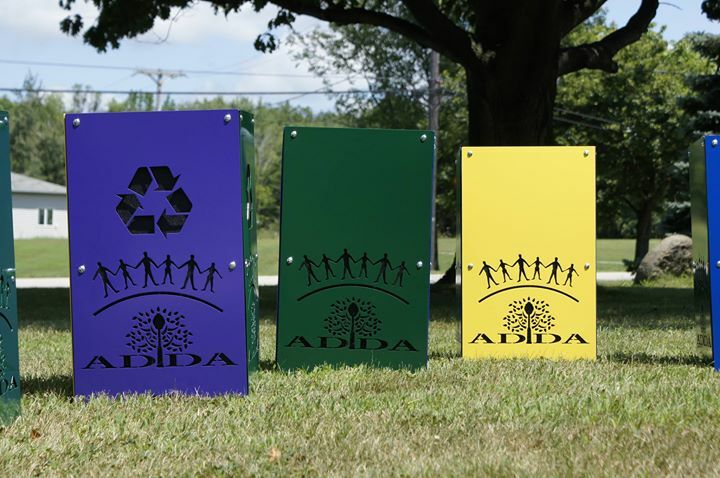 We are proud to have made the 40 wooden easels used for the ADDA’s Art in the Alley event. This free event is an outdoor art show with over 20 artists and is located in the alley and parking lot by Dublin Down, 4618 Main Avenue, Ashtabula, Ohio. We have been working on the "Arches" for Ashtabula County's Lights on the Lake. Improvements to the Arches include "quick connect" hardware to make installation at Lake Shore Park easier, added some extra height to give a little more clearance for busses, and LED lights for less power consumption. 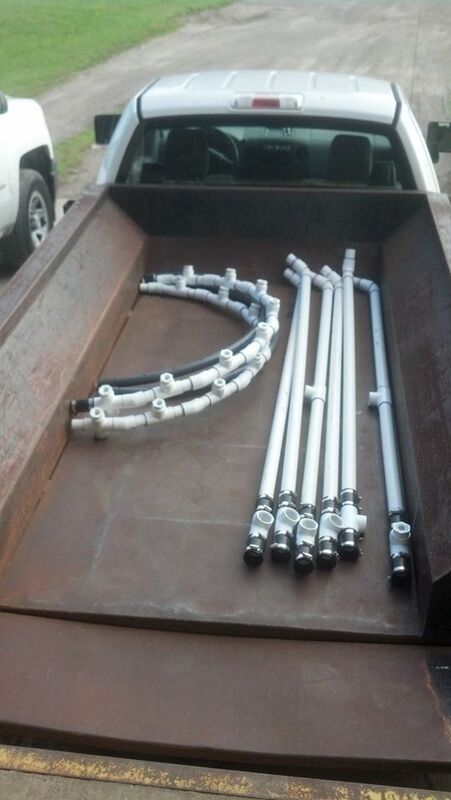 Getting ready for the rough "fit up" of the Spray Pipes for the Cornelius Park Fountain. This is the first step in getting the Fountain operational. Once we have the fittings and connections figured out, the pipes will come back here to the shop for testing and adjusting. 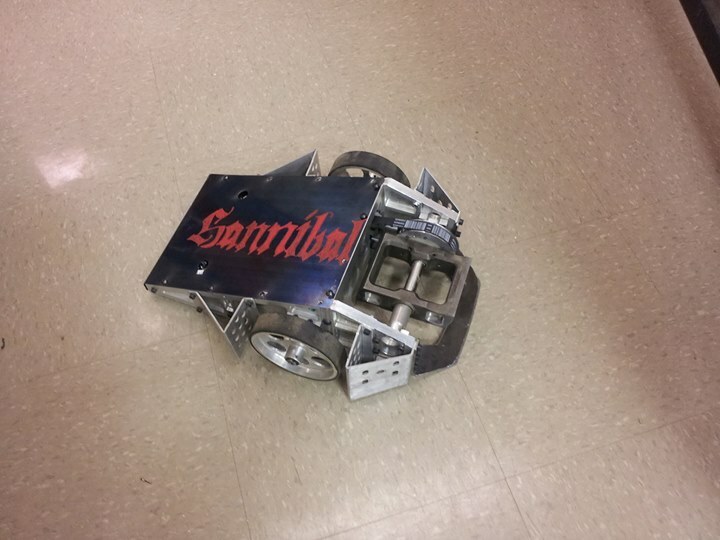 Hannibal - ready to compete in the 2015 AWT Robobot Competition at Lakeland on April 25, 2015. This is the ATech "A-Team" entry built by the Precision Machining Class. © 1999 - 2019 Fargo Machine Company - All rights reserved.